THE number of hospital deaths reported ‘late’ to the coroner in Northern Ireland has doubled in the last year, The Detail can reveal. The latest figures have emerged at a time when questions have been raised about the systems in place for investigating hospital deaths here. Deaths reported to the coroners’ service after three or more days are included in the figures. However some cases were reported up to six years after the death occurred. Meanwhile new figures seen by The Detail also show that deaths in England and Wales are almost twice as likely to be reported to the coroner compared to Northern Ireland. 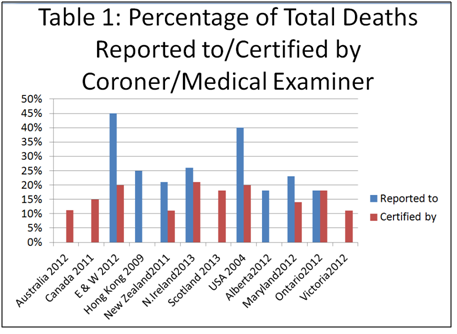 Mr Luce’s figures refer to all deaths reported to the coroner, not just hospital deaths. 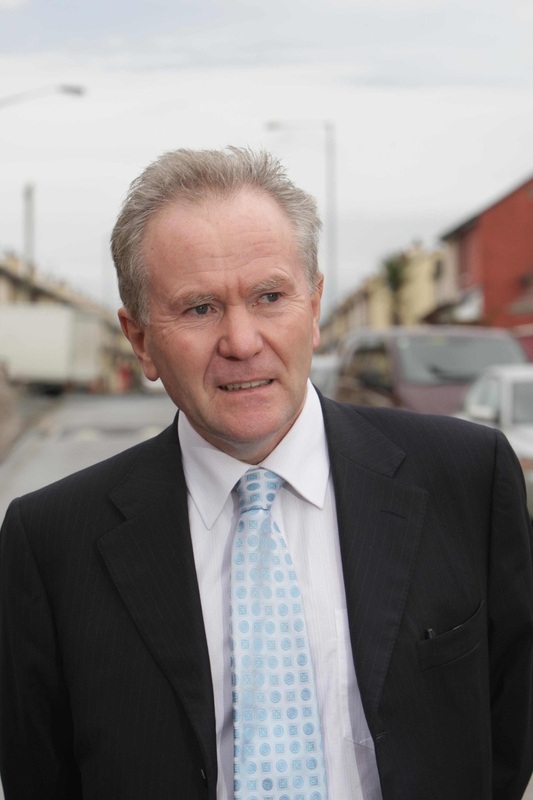 The data comparing Northern Ireland referral rates with other parts of UK has been compiled by Tom Luce who chaired a major UK government review into death certification following the Harold Shipman murders. His figures show that in Northern Ireland only 26% of deaths are referred to the coroner, compared to 45% in England and Wales. Alongside Dame Janet Smith’s public inquiry, Tom Luce’s 2002 review into death certification was established to look at how deaths were registered in England, Wales and Northern Ireland. Now new comparisons compiled by Mr Luce for a seperate research project have been made available to The Detail. The figures show that Northern Ireland rates for referring deaths to the coroner are notably lower than those for England and Wales. In Northern Ireland only 26% of deaths are referred to the coroner, compared to 45% in England and Wales. Speaking to The Detail about the figures Mr Luce said: “This does not of itself suggest inadequacy in Northern Ireland rates because those for England and Wales are way above international norms. The latest data compiled by Mr Luce was obtained from Freedom of Information requests sent to the Northern Ireland Courts and Tribunal Service as well information from the Northern Ireland Statistics and Research Agency (NISRA) June 2014 Statistics Bulletin. Mr Luce stressed that the figures must be looked at in context. He said: “Had the Northern Ireland rate been very low, one might assume that there may be significant under-referral. 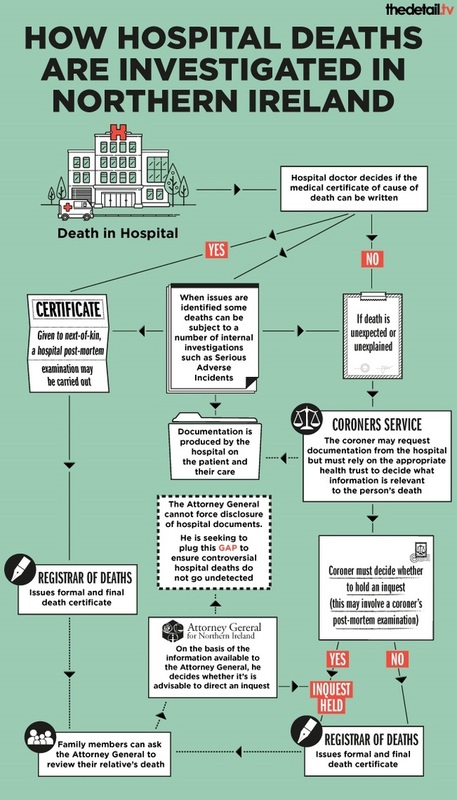 Figures obtained by The Detail under a Freedom of Information (FoI) request outline the number of hospital deaths that have been reported late to the coroner. The coroners’ service emphasised that there is no provision in the Coroners’ Act for deaths to be classified as ‘late’. For the purpose of The Detail’s FoI request they have included deaths reported three or more days after the date of death. The figures in the table below outline those cases were there was a delay between 2010-2014. The number of hospital deaths in Northern Ireland reported late to the coroner doubled in 2014 compared to 2013. Meanwhile a further breakdown of the top ten longest referrals in 2014 ranged from delays of one year to over six years. The coroners’ service also provided a breakdown of the reasons why cases were delayed in 2014. Three cases were re-opened at the direction of the coroners’ service and one was re-opened after a request from a family’s solicitor. This usually happens in circumstances where a death has been reported to the coroner and subsequently closed, but it is opened again after further additional information is made available. Six cases were re-opened in 2014 as a result of “new information”. This occurs when a death was not initially reported to the coroner but is referred after new information becomes available. For example the hospital may become aware, through internal investigations such as Serious Adverse Incidents, that the death should in light of evidence found, be reported to the coroner. Click this link Investigating hospital deaths.jpg to see a special infographic designed by The Detail that looks at how hospital deaths are investigated in Northern Ireland.